Although how I wish, lifelong Liverpool fan that I am. And yes, I got caught by surprise; but then, so was everyone else. It wasn’t even a case of Fergie going, going, gone. It was just gone. As is the modern way, the announcement was first made by the club on Twitter. And since everyone is following everyone else on the social network, pretty soon it was on CNN. And that was when the entire world fell on the Republic of Mancunia. How they must be celebrating in pubs all over Merseyside, that I can only imagine. With a smirk. It’s a tricky one, this, for the Mancs. 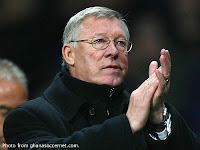 Fergie was at the helm for so long and was a larger-than-life character that there is every possibility that there will be a problem with the turnover. Go ask AVB. During the halcyon days of Liverpool’s dominance of the English game in the seventies and eighties, the succession policy was to always hire from within. The policy was sound for the era and ensured continuity. In other words, United’s successes have been as much due to the club’s brilliance as a business entity as they have been to Fergie’s tactical nous. The club can and will continue to have the ability to take out the checkbook to bring in some of the world’s best players and – if need be – the best managers. If Internet gossip is to be believed, then the Mancs are keen to bring in Everton’s David Moyes as Fergie’s replacement. Moyes, a Scot like Fergie, appears to be an excellent choice on paper. His contract with Everton expires in the summer and he has kept his club respectable and competitive despite its meagre resources. The logic here should be that, with United’s financial clout and better players at his disposal, then he can continue with the successes that the United faithful have been spoiled with for the better part of Fergie’s long reign. But this thinking can just as quickly be United’s quicksand. First of all, at Everton, the team more or less selects itself. With United’s larger squad of international players in all positions, will he have the savvy to choose the right team week in and week out? Success at Everton is mid-table security and the occasional incursions into European competitions. At United, second is considered a disaster and European competition an annual expectation. Can Moyes cope with the pressure? Be that as it may, if an experiment with Moyes ultimately proves unsuccessful, then United have the clout to bring in somebody with real pedigree. It is in its corporate outlook, after all, where United is strongest. In the late eighties, United were being criticised by rivals for the frequency with which the club changed its playing kits. It was too much of a burden, they said, for the fans who bought the replica shirts and other merchandise. Of course, these days, everyone is doing exactly the same. Long before it became fashionable for football clubs to float shares in public markets, United had already done so. In other words, United were always ahead in the financial game; and it is no surprise that it is the wealthiest club in the world. That is why much as I am amused by the misery in Mancunia, I don’t think Fergie’s retirement will significantly impact United’s recent tradition of success. The modern game is about money; and this, United has plenty of. Fergie is a good manager and yes – grudgingly – perhaps even a great one. That said, there was nothing about the football played by United under him that I can say I did not see during Liverpool’s golden era. In fact, I still consider Kenny Dalglish’s 1987-88 squad head and shoulders above anything that Fergie has put together over the years. Thus, I expect to continue to be annoyed seeing United at the top of the table or thereabouts in the coming seasons, the loss of Fergie notwithstanding. Unless the pendulum has started to swing away from Old Trafford; and indeed, they do say that success in football is cyclical.